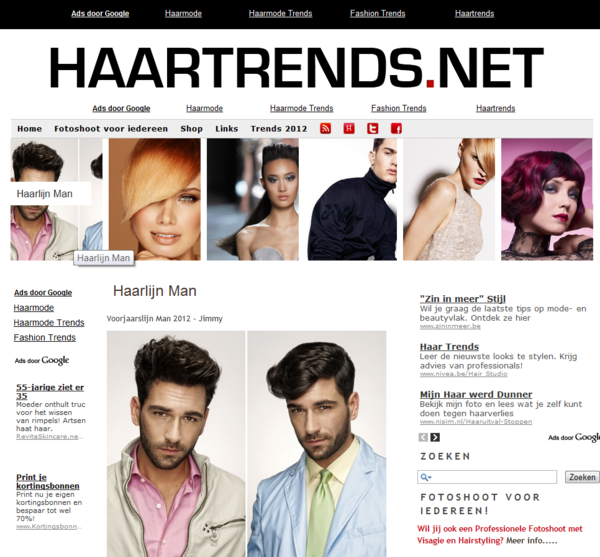 Haartrends.net is a Dutch-language blog about hairdressing fashion, publishing photo-heavy articles about the latest trends in hairstyling. It is hosted on the TypePad platform. YesItCan.be was contacted by Haartrends.net to add a ribbon to the blog's main header, consisting of thumnailed version of the photos in the latest entries, along with the titles of each article (which would become visible as visitors hovered their mouse cursor over each image in turn). The blog was using a design created with TypePad's powerful design editor. While a lot can be done with this tool, the photo ribbon was not possible with it. In order to achieve the full control over the design needed to accomplish this, the existing design had to be ported to TypePad's advanced templating system. YesItCan.be took care of this, and then added the photo ribbon, using TypePad's templating tags and some custom CSS to generate the thumbnails needed to achieve the desired result.